Your child needs a room that’s equipped with furniture and accessories that meet their needs as they grow up. Whether your kid just upgraded from their crib to their first real bed or your growing pre-teen needs a furniture set that fits, American Freight Furniture and Mattress has what you need. Today we’re talking about bedroom packages for kids and tweens of all ages. We’re going to break down the bedroom necessities for children as they get older. Adding pieces over time will help you keep your child’s room decluttered. You can expect to learn all about different furniture pieces and how to stage them for your child’s bedroom. We’ve even included safety tips to make sure your little ones are safe in their bedroom if they’re left alone to sleep or play. Best of all, we’ll give you our top recommendations for kids bedroom sets from American Freight. We offer individual products and complete bedroom sets to match your budget and needs! Keep reading for kids bedroom furniture ideas for your home. What Furniture Does Your Kid Need? Once your little baby is, well, no longer a baby, they need more than a crib and changing table to meet their needs. We’ve broken down kids bedroom furniture recommendations loosely based on age and size to help you navigate buying furniture for your needs. If your child is ready for their first “Big Kid Bed” you need to reevaluate the furniture in the nursery. Items like the changing table and crib can go, however, consider keeping furniture like a rocking chair or accent chair in the bedroom to continue nighttime rituals like bedtime stories. If you don’t have one already, your child will need a chest of drawers or dresser to store their clothes. Keep in mind, your current clothing storage might not be large enough for all your kid’s clothes for much longer. 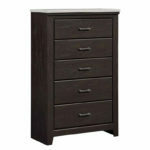 Consider upgrading to a large dresser with extra space. As your kid grows up, they’ll be able to take advantage of more drawer space. The final piece of furniture that’s essential for little kid bedrooms is the nightstand. Young kids need a place they can reach while in bed to place their glasses or keep a cup of water. We recommend staging a table lamp on top so they can turn their own light off and on. Read more about our favorite table lamps here. For more inspiration for kid bedroom ideas, visit your nearest American Freight Furniture and Mattress store. As your child gets older, they need more furniture to store their belongings in drawers and on surface spaces. Depending on the size of the bedroom, you might consider adding onto the bed, nightstand, and dresser combination we recommended earlier. One way you could upgrade your kid’s bedroom without cramping the room—or their style—is to add another standard size storage piece. 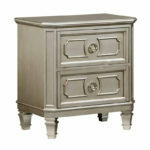 Whether you have a chest of drawers or dresser, consider adding the other. Your kid will have more space to store clothes and display their favorite toys and trinkets. Make space for this new storage piece by eliminating a chair or toy chest they don’t use anymore. Now that your kiddo is basically a teenager, they probably need a new bed! 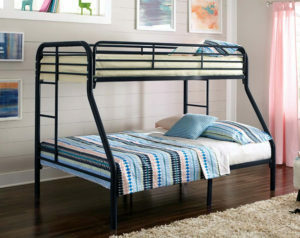 For pre-teens, the only addition we recommend for their bedroom is switching out their bed size. Whether they upgrade from a Twin to a Full bed or a Full to a Queen, this choice will come down to several factors. One, what size bed will fit in the bedroom? Two, what size bed meets your budget? Three, what size bed will fit your child’s needs? Once you measure your room and make a decision, stop by your local American Freight Furniture and Mattress to browse the wide selection of discount bed frames. You could even go the extra mile and upgrade the entire children’s bedroom set at once. Keep reading to learn five of our top bedroom set recommendations. Fasten your dressers, nightstands, and chest of drawers to the wall. If you have little ones that love to climb furniture, it’s essential to make sure the pieces won’t come tumbling down on top of them. Push the furniture as close to the wall as possible. If you don’t want to secure everything to the wall, this is the next best thing. Whether it’s a dresser or a nightstand, the closer a piece is to the wall the harder it will be to get it to topple over. If possible, push your child’s bed into a corner of the room. If your young child rolls around while they sleep, the wall alongside the bed will act as one barrier and you can install a fold-up gate for the other side to keep them from falling off the bed. These tips typically apply to very young children, but can still benefit all ages. Another rule of thumb is to make sure you’re familiar with which direction the bedroom windows face. Whether you get the most intense sunshine at sunrise or sunset, you should plan your bedroom layout accordingly. Now that you have a little more insight on your child’s needs for bedroom furniture and staging, you’re probably ready to shop. Luckily, American Freight Furniture and Mattress offers affordable bedroom solutions. Your children’s bedroom furniture should be stylish and affordable. When you shop our inventory, you get the best of both worlds. Keep reading to learn more about our recommendations for children’s beds and bedroom sets at various stages of childhood. When your child outgrows their crib and needs a new bed, we have the perfect bed frame in mind. 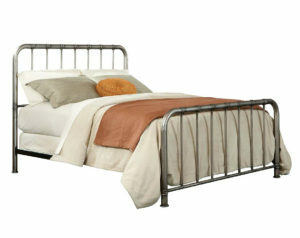 The Chocolate Heartland Mission Captain’s Bed with Trundle is great for kids. The rich wooden Twin bed frame features a pull-out trundle underneath. Tiny tots can use this as a step to climb into bed. Plus, this bed is sleepover-ready in just seconds! The bed also comes in a Honey Pine finish. If your little one would rather have a bunk bed, you’re in luck! We’ve got the scoop on quality bunk beds for kids right here. Once your child outgrows their twin bed, they’ll need a new one to grow into. 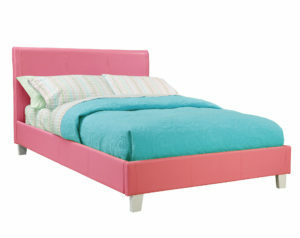 For young ladies, we love the original Fantasia Pink Bed or the version with the Trundle. This soft pink bed is beautiful and simple for all little girls who want their rooms to look pretty in pink! For young men, we like to recommend the New York Black Trundle Bed. The black synthetic leather bed will give their bedroom a masculine look. 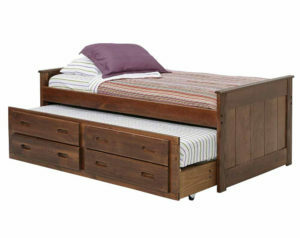 Plus, this bed also features a trundle for storing bedding or clothes easily. By the time your kid is a teenager, they’ll need a complete adult bedroom set. We’ve rounded up five of our favorites to give your teenager plenty of options to choose from. 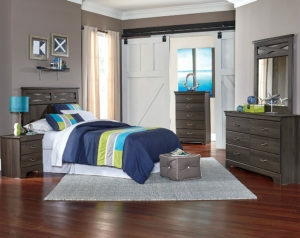 This smoky, weathered wood bedroom set features a gray-brown color throughout. The curved silver hardware gives the set an upscale look. The Mayson set comes in Queen and will look incredible with any bedroom theme. For a charming, country white look, choose the Taylor. The distressed wood set is all-white with dark gray hardware. 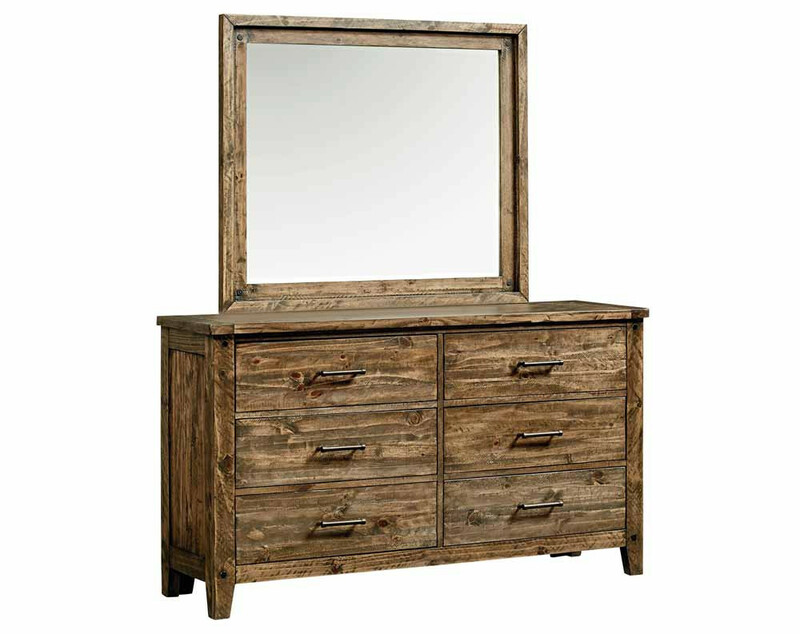 It features curved wood carving on the base of each piece, the mirror, and the headboard. The Bolden is a sleek, black, modern bedroom set. The square and rectangular set features slim silver hardware and a glossy finish. Black goes with everything, so this set will certainly make your bedroom theme pop! 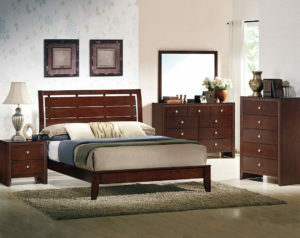 The perfect modern cherry bedroom set is the Evan. The ladder back headboard and simple round chrome hardware make this set incredibly stylish. Plus, each piece rests on short legs to give the set a high-end appeal. 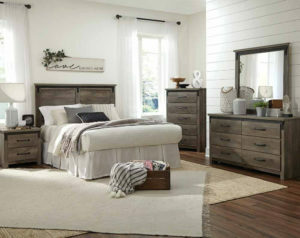 A rustic and farmhouse-inspired bedroom set could be the perfect fit for your teen’s new bedroom furniture. The Cheyenne has a weathered driftwood design and dark hardware that mimics sliding barn doors. Children’s bedroom furniture and kids’ room ideas don’t need to be an elaborate ordeal. The right furniture, paint or wall decals and fun bedding can make the room very special for a kid at any age. For more decorating ideas, check out our blog about bedroom sets and wall murals here. 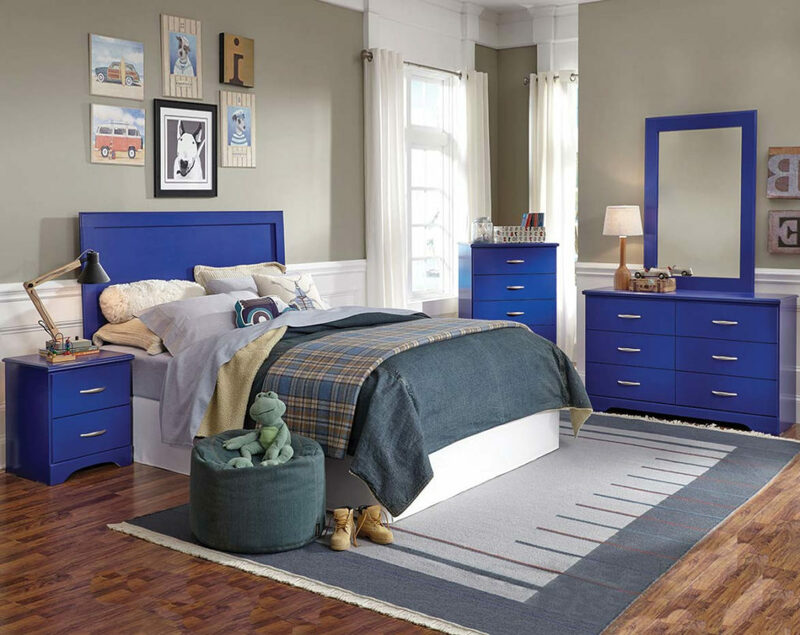 Shop all your favorite adult and children’s bedroom sets at American Freight. 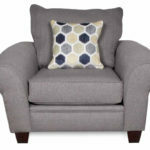 We offer quality furniture at a discount you have to see to believe. Click here to find a store near you! Our mission is to sell quality furniture and mattresses at everyday low prices while providing excellent customer service. We believe everyone needs a place to sit, sleep, and eat. Get a House Full of Furniture! Find a Local Store Near You!